Archive by category "Society Billing Software"
When we started ApnaComplex, our objective was simple – Help create Happy Communities. We are proud and super excited today when we received the following testimonial from Mr. Praveen, Hon. Secretary of Ferns Habitat Owners Association, a gated community near Doddanekundi, Bangalore who have been using ApnaComplex now close to an year. ApnaComplex is really an efficient tool for Association management activities and effective communication, and it really makes life easy for all the management committee Members in all areas including treasury management. The Ferns Habitat Portal built on ApnaComplex really changed the environment in a very positive manner and created credibility among the members about treasury and all the Association related areas. It has helped in bringing in transparency effectively in whatever the Association do. Many members who were detached from the community were brought back on board in the system and we see many smiling faces around. The society environment has improved drastically and there is no match to the feature rich experience we have with this amazing software suite. You think of a feature and let them know, to your surprise, you will get a reply that either they are doing a beta testing or the feature is under development. Man, these guys are so close to the customers and market. I think I enjoyed my tenure as a Gen.Secretary largely by bringing this software into practice in Ferns Habitat and making it as the backbone of the community today. Long Live ApnaComplex !! Thank you Mr. Praveen for your words!! We are glad to have helped you create a happier society. Want to create a happy society? Get on to ApnaComplex – Today! ApnaComplex is India’s most comprehensive web based housing society accounting, management and communication software. It is designed to make the life of residents and owners way lot better by bringing in more transparency and accountability in managing a housing society. Check out the features of ApnaComplex and sign up your society today to get the benefits! We offer a free 30-day trial as well so that you can try before you buy! We are happy to announce a key new addition to ApnaComplex feature set – ‘Automated Scheduled Reports’ – that is available for every society. With this feature, any one in your society can now receive various reports by email at a pre-defined and periodic intervals (OneTime, Daily, Weekly, Monthly). You can schedule reports to be sent to entire community/owners/committee/sub groups or to a selected set of individuals. 1. Improve Financial Transparency by auto-publishing Income/Expense statement to all owners every month! 2. Schedule to send List of all expense details for the week to the entire committee! 3. Get End of the day cash/bank balances on a daily basis! 4. Automatically send updated key contact list once a month to entire community! 5. Get Bouncing email ID report once a week! and much more… All just by configuring for few minutes. There are around 40+ reports available for scheduling. As always, the list will continue to grow as we move forward. To start using this feature, go to Reports->Reports List and click the ‘Scheduled Reports’ button. Please note that the system shall execute and send reports post mid-night every day. Housing societies, welfare associations and folks managing multi-tenancy buildings/ complexes keep collecting recurring dues from the members. Members usually pay their dues through Cheques, and these days transfer money through NEFT to the Society Bank Account. Non-resident owners also use one of these modes to pay their dues. However, keeping of track of payments from several members, validating the bank transfers, accurately issuing receipts is a big issue for the treasurers and accountants and the amount of money that lies in “Suspense” account head keeps increasing as mapping the payment received to the correct flat is quite time consuming. This triggers a chain of issues – complaints from members of not getting receipts, unable to accurately impose late payment charges properly, accurate defaulters reports and so on. Advantages of an Online payment system where members can pay their maintenance dues and get an instant receipt from the are now obvious – in addition to getting money securely into the bank, treasurers/accountants can heave a sigh of relief due to tremendous savings in the reconciliation efforts and other issues mentioned earlier! As everyone is aware – ApnaComplex offers a Payment Gateway module using which members of Housing Societies can pay their dues online and avoid all the reconciliation problems mentioned above. A word of caution: Integrating with Payment Gateways and offering such a solution needs to be thorough, requires lots of due diligence to ensure safety of the money and comply with all relevant regulations. There have been providers in the market offering solutions for Housing Societies that were not fully legally compliant and were forced to change their solution. This has created a dent in the confidence of Housing Societies to go fully online. With the vast industry experience the founding team brings to the table, trust ApnaComplex to not offer services hastily without appropriate due diligence. The online payment gateway platform offered by ApnaComplex is a reputed Payment Gateway operating in India since past 7 years and is compliant with PCI, ISO 27001 & RBI norms, whereby funds are settled directly to existing bank account of the society, via trusted banks in India for your society’s members to transact online with confidence. Here is the detailed explanation on the online payment gateway integration in ApnaComplex.com that can clarify various questions we keep receiving from our prospects and customers. ApnaComplex is an alliance partner for one of the leading payment gateways in India who enables the online payment platform for Housing Societies. As a first step, like any other business that collects money, the Housing Society or the RWA which is going to collect the funds electronically shall be setup with the Payment Gateway as a “Biller” (also referred as Merchant in Online Payments terminology). For this, the Society / RWA has to submit legal documentation related to AGM resolution authorizing the association to be a biller and other KYC documents. Once verification and scrutiny of the documents is done, the Payment Gateway shall register the Society/RWA as a ‘Biller/Merchant’. This entire process is co-ordinated by ApnaComplex.com with the society. Upon successful verification and merchant registration, merchant details are provided to the society by the Payment Gateway. The same merchant details shall be updated in the ApnaComplex portal, and the online payment facility is turned on for the society’s portal hosted on ApnaComplex. 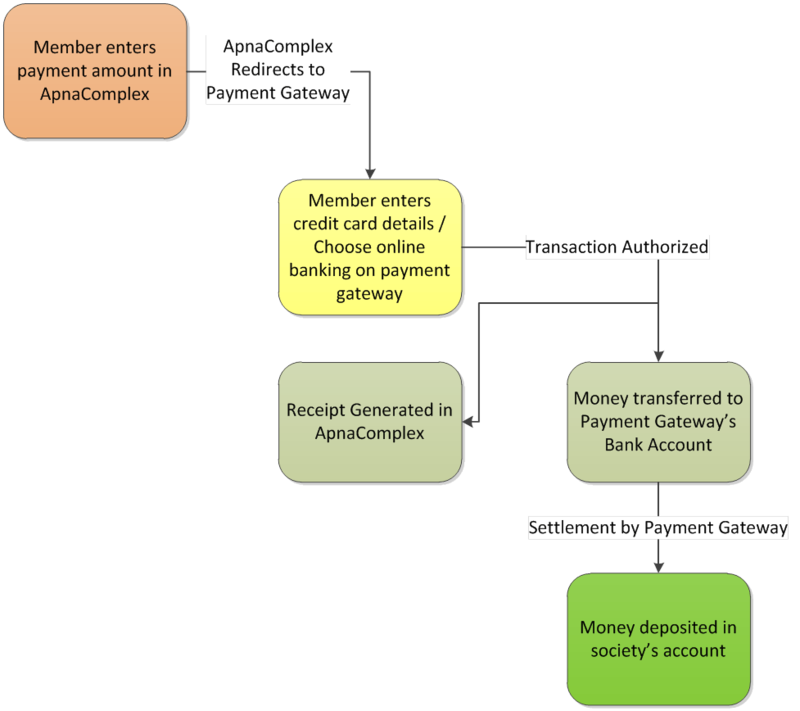 A members logs into ApnaComplex.com and selects to make a payment using Payment Gateway. ApnaComplex redirects the user to Payment Gateway along with the Merchant details of that society. The funds flow from the members account/credit card to the account of the Payment Gateway. This is an RBI monitored bank account. The payment gateway transfers the money to Society’s Bank Account directly. It is important to note that the money paid by member NEVER comes to an account which is related to ApnaComplex.com in any way. The funds flow from the Member’s Account to the Society’s Bank Account using RBI approved and monitored channels – thus making this a fully legally compliant mechanism for making online payments. Proven Technology Stack – No need to Re-invent the Wheel: The complete technology stack that processes your funds is used by thousands and thousands of merchants daily (including some of the leading e-commerce sites in India) and is owned by an organization which provides payment gateway functionality in around 50 countries around the world. Fraud Detection: The complete system of managing the funds and getting them transferred is done by a leader in this area with sophisticated tools for fraud detection and risk management. Easy Compliance: As the payment gateway is one of the leaders in the space, they keep their systems updated as per RBI guidelines that can change from time to time. No Additional Benefit: There is no additional benefit that we can offer to our customers by we becoming a payment aggregator ourselves. Instead that exposes them to greater risk due of non-complaince and fraud due as mentioned in earlier points. We have always valued legal compliance over business and are glad that we are providing the users of ApnaComplex.com an effective, compliant and with leading edge technology. If you have more questions, please feel free to Contact Us with your queries. ApnaComplex now provides a view into the audit logs that are maintained in the software automatically. Administrators can now see the list of expenses and non-member income entries that were deleted along with the time stamp of deletion and details of the user who deleted them. Makes it easy to investigate any “missing” transactions. Go to Expense Statements and Non-Member Income Statements to see this in action. Never face an issue of “I remember entering that expense last time, wonder who deleted it now” – which happens in most desktop based accounting software. In yet another first and setting the standards for web based society accounting, ApnaComplex announces the availability of a new Penalty Rules Engine to all the customers. While ApnaComplex all along had the ability to calculate interst rate based on a percentage rate of the reducing outstanding balance, we now enhanced the penalty calculation engine to be able to calculate penalty for a wide variety of cases such as one time late penalty, per day penalty, %age on invoice value, %age of the outstanding value, slab based penalties etc. All the treasurer needs to do is to set choices for various criteria and get the penalties at the click of a button. 1. Calculate penalty at a flat rate of Rs. 25/- per every day of delay. 3. Calculate penalty at a compounded rate of interest on the invoice amount. 5. Calculate penalty at 2% per month on reducing balance as per the payments received against an invoice. Now, don’t you call this a true Diwali Gift for the treasurers! ?